Tracking time is easy. You can track time under my time, desktop timer, or floating widget. Use My time to see all your time entries. Tracking time in Productive is simple. Just navigate to the Time tab and select My time. 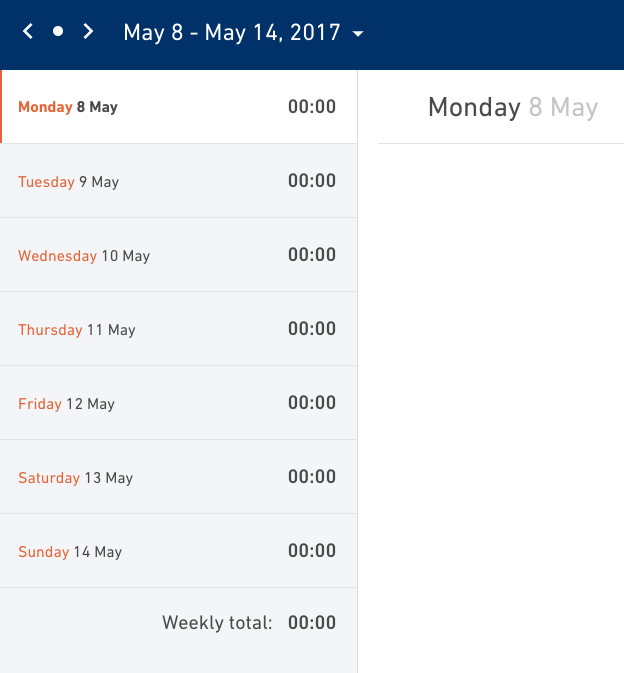 Left side of the screen is a list of days in a current week and current day is selected by default. You can pick any day from the list and start adding time entries for that day. Use arrows to navigate between previous and next week. Click on the dot in the middle to get back to the current day. 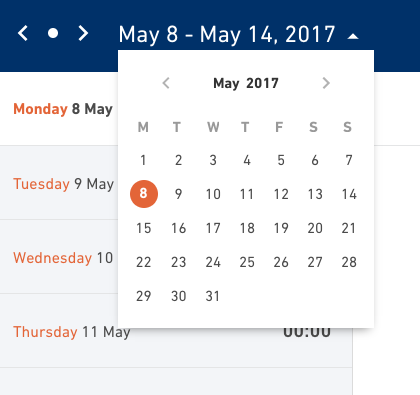 You can also choose a date from a calendar. You're tracking time against a particular budget and service. If you're a Web developer, you'll choose the Web development service from the drop down menu. Pay attention to budgets and projects. Every project has at least one budget, and a budget has at least one service. So when you're tracking time, make sure you've selected a service from the right project and budget. Put down a brief description of what you've been working on in the Note field and for how long. When you're done filling out the form, hit the Save entry button. You can also use Start timer feature and Productive will automatically record the time you were working on a specific service. Just don't forget to come back to the Time tab and stop the timer when finished. If you are Scheduled on a project and service during a certain time period. You will get automatic time tracking suggestions under My Time. Clicking on these suggestions will pre-fill the Budget and Service for you. All you need is to add the hours and click Save. Can't find a service you need? There are a few possible reasons why you can't find a service. 2. The budget is closed - you can't track time against a closed budget. Why is that you ask? If it's closed that means it's ready for invoicing. When you add a few extra hours to a budget, it changes financials. If it's a fixed price deal, adding more hours means your profit drops a bit. If it's an hourly budget, adding more hours means that your client is paying more. If you need to track time and the budget is closed, you need to reopen it first. 3. The date range is wrong - you need to go to the budget and set the date so it overlaps with the date you want track time for. Can't track time because your cost rate is not defined? Yes, you need to make sure that every person who needs to track their time has a defined Cost rate. This is important because otherwise Productive can't automatically calculate profitability on a budget. Read more about defining a cost rate here.